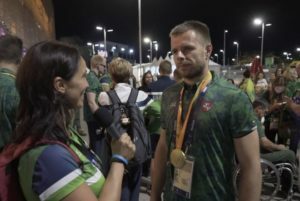 Today we step back into our inspiring conversation with Genrik Pavliukianec, the NeoLife customer who was recognized as a top scorer in Rio 2016 Paralympics. We start off with his first meeting with NeoLife. – The first time I met NeoLife products was in 2014 when my friend and NeoLife distributor Laimutė Mizgirienė invited me to a seminar about sports and health. 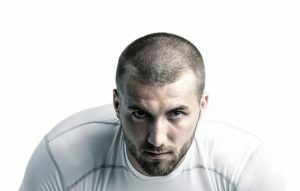 I started to use the products together with my team member Marius when we were training for IBSA World Games in Seoul. – Since I started using the products I have noticed that I have gained more energy, my body metabolism is more balanced, and my body has been able to recover better after long workouts. 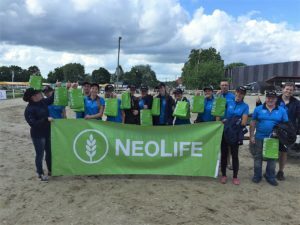 After the World Games we also competed at the European championships and thanks to NeoLife products I was able to stay energized and resistant. I was playing without breaks and I never felt a lack of energy or wellbeing. – I was so satisfied with the results that these products gave that I decided to take them during the long training period to Rio. It’s so important to get all good nutrients, and even more important to get them from whole food sources. My wife and our 9 year old daughter are also using NeoLife products, and I’m happy to say that last year we were full of energy, we were not sick, and I think that this should be credited to NeoLife. We all know that nutrition is important if you want to feel well and perform your very best, but if you want to achieve your goals you also need motivation. We asked Genrik to share his thoughts on success and tell us what motivates him. – Success is created of the experience and by how well you have been prepared. The best motivation is the highest achievements in the most important competitions, at Paralympics in my case. Our national team has already had many medals from different championships and Paralympics, and it was the Paralympic gold that was missing. The best motivation for me is my goal. I like to divide a big goal into smaller parts and go forward step by step. After a while you can see that you don’t need any special goals: when you take one step and reach something, you automatically aim higher and higher, and you climb to the very top. – I had two goals in Paralympics 2016 – to win gold medals and to gain revenge over old competitors. I also had a third, secret personal goal – I wanted to prove to myself that at this age (40!) I’m able to win and stay with the team until the end. I injured my hand before the Paralympics and was not sure if I would be able to play. But I realised that the 170 game minutes at the Paralympics are so short compared to the long way of trainings and preparations. – It was a good feeling after winning a gold medal, but not the one that I had been expecting. I didn’t feel the same as I did when I won my first medal. I understood that these games will most likely be my last. I wanted to reach the top but when I reached it I felt sad because I knew that it’s time to retire, there are no more goals for me in the sports. We thank Genrik Pavliukianec for sharing his story. We hope that it has inspired you to work hard to reach your goals, to be the best leader you can possibly be, and to have fun with your team! 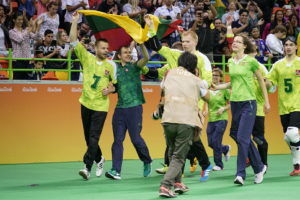 As captain of the Lithuanian national goalball team Genrik Pavliukianec led his team to success in the 2016 Paralympics in Rio. We had a chat with this loyal NeoLife customer and Paralympic gold medallist; an interesting conversation about leadership, motivation and determination. We will publish Genrik’s amazing story and interesting thoughts about leadership in two blog posts this week. – I have had a visual impairment since I was born. When I was a school boy at the Blind and Visually Impaired centre I saw how students were playing a rolling ball but it didn’t catch my interest. 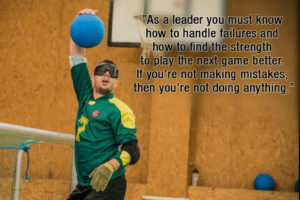 The game was a bit different at that time but it has changed during the years; game rules have changed and all goalball players nowadays have to wear eye masks to equalize visual impairment among the athletes, Genrik explains. Genrik has been a member of the national goalball team since 1997 and when the team needed a new team captain, the choice was clear. – The players voted for me and I was chosen as captain for several reasons: I have a long competing experience, Rio was my 5th Paralympics, I am not scared of taking responsibility and I am always ready to play. As team captain I have to be a captain on the court and outside it. Team members have to trust the captain 100%, because otherwise they can lose self-confidence. I have always tried to be a good captain who is self-confident, who believes in the team and in victory. – Before the Paralympics we spent a lot of time with the team; training and having fun together. As a real family we used to gather together on the weekends, have barbeque with our families. This is the way you can strengthen your team spirit. It becomes clear during our conversation that Genrik is a passionate leader with a strong sense of what it means to be a leader. – It’s not easy to be a leader. I believe that a leader is someone who is ready to take initiative, who is not scared to hear criticism, and who has a high confidence in himself. As a leader you must know how to handle failures and how to find the strength to play the next game better. If you’re not making mistakes, then you’re not doing anything. The Paralympics is not the place for fear. You have to leave all yours fears and doubts at home and fight till the final moment. I don’t like being on the court with a player who is scared of the competitor. – It’s important to have a strong psychological background in the team, but it’s also very important to have good relationships. I know that working with people might be very difficult, because people are different and sometimes they make small things look big. A team is like your family where relationships depend on us. Sometimes you have to stand back, or recognize that you were wrong. Catch the rest of Genrik’s story later this week on the NeoLife blog. Autumn is just around the corner and nature will soon display its most beautiful, fiery colours. Why not get your inner fire going and spread some colour and energy in your life as well? Whenever you feel tired or frustrated, when life simply is not what you want it to be, a common advice is to slow down and relax, find your inner peace… But what if it is the opposite that you need? Maybe it is time to add more action to your life, not less. By spending more time on things that you feel passionate about, things that really get you fired up, you will get more energy and become a happier person. Challenge yourself with an autumn filled with passion. Step out of your comfort zone and throw yourself into anything that gets your fire going. When you really challenge yourself, and work harder than you thought you could, when you do the things you never thought you’d dare to do – that is when you get the greatest rewards! We were not created for a life of comfort. It is time to realise that you greatest enemy in the pursuit of a healthier and happier life is not stress or “too much work”. Your greatest enemy is comfort. A comfortable life has no challenges and offers no rewards. A passionate life is filled with challenges, adventures, and a lot of hard work. A passionate life is a rewarding life. How do you choose between comfort and passion? Please share your thoughts in the commentary field. The Greatest outdoor Equestrian Event in the Baltic’s for show-jumping and dressage in 2016, the Cavalor Baltic Summer Cup 2016 took place in Ruila stables, near Tallinn. The competition program included national and World Cup rides, and the whole event brought together about 200 riders and more than 200 horses. Baltic Summer Cup 2016 is an international competition offering something for every level of competition. Organizing such events needs a lot of cheerful and active people who love horses and equestrian sports. Most of those people volunteer. Their contribution to the event is generous and unselfish. That’s why we are extremely happy and grateful to NeoLife, who decided to support this venture. The volunteers were pleasantly surpris ed and sincerely happy for the NeoLife products they received. NeoLifeBar, NeoLifeTea and Shake gave them extra strength and energy to organize the four-day competitions. Many of them heard about NeoLife for the first time and we were more than happy to tell them where they can find more information about our products and business opportunity. Estonian Championships in resistance and dressage will take place in the end of August 25-28, and we plan to support them the same way, mostly through volunteers, 50 people altogether. A large group of enthusiasts took a bicycle tour from Mažeikiai to Šventoji. There were 50 participants from Mažeikiai, and others joined them later in Skuodas and Kretinga. It’s a very well-known truth that there is no such thing as poor weather, only poor clothes. Also the attitude has to be right. Bicycle enthusiast started the tour 10 June in Mažeikiai and cycled 120 kilometres in two days. More than 60 cyclists reached the finish line. The idea of the bicycle tour was to support building a bicycle path from Mažeikiai to the seaside. 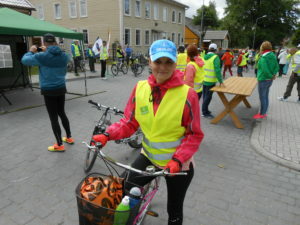 It was nice to see the youngest participant – Augustė Šilinskyte (age 10) who cycled the full distance with pride, and also the oldest one – Valdemaras Padskočius (age 72). Everyone was excited to see Vytautas Valantinas, who drove 50 kilometres with his scooter-bicycle. Bicycle tour partners were Mažeikiai tourist club, Skuodas sport centre and Kretinga bicycle club. Our NeoLife distributor Gintarė Liaučiuvienė also participated in the tour and shared the information about good nutrition and lifestyle. This kind of projects or public events might be very useful for introducing people to NeoLife business and products. Participants at events like this are likely to be interested in a healthy lifestyle, and have a positive attitude, and this makes it very easy to talk to them and share the products. NeoLife received very special attention from the participants, partners, the Lithuanian bicycle federation and municipality representatives during this Bicycle tour. On the last day, all the participants had a chance to taste and enjoy NeoLife bars, tea and shakes. They received information about the products and their unique qualities. It was fun to listen everybody chanting the NeoLife name. The three-day tour was a great experience. The weather was not good and we needed lots of energy to cycle when it was raining or strong wind was blowing. We slept in tents when the temperature was below 10 degrees outside, but we had a chance to reconfirm once again that NeoLife products are the best thing people can do for their wellbeing. We were taking NeoLifeTea, NeoLifeShake and NeoLifeBars during the tour and it loaded us with lots of energy. We didn’t feel hungry and with a help of NeoLife products we cycled the distance of 120 kilometres very easily. Regardless if you do it in the gym, or in your everyday life; lifting weights will make your muscles stronger. Sitting comfortably in your couch will not make you stronger. We all know this. Every time you lift something, or carry something heavy, you force your muscles to work and as a result they grow stronger. You challenge your muscles – they respond by growing stronger. The same pattern applies to your inner strength. If you want to become a stronger person, you have to challenge yourself, put yourself in situations where you are not comfortable. To exercise your mental muscles, you need to get up from your comfortable couch and put yourself at risk. If you never put yourself in situations where you are at risk of failing, you will never achieve success. If you keep lifting the same weights at the gym every week, your results will diminish with time. And just like physical exercise needs to get tougher as you grow stronger, your mental challenges also need change as you grow stronger. Be active in finding new challenges for yourself. Put yourself in situations where you have not been before and where you do not feel comfortable. By challenging yourself, and by failing from time to time, you will exercise those mental muscles, you will grow stronger as a person, and for every challenge you will be one step closer to success! The right time to rest and relax is when there is no time for it. In many cultures every week has traditionally had one day of rest. But in today’s society, who can devote one full day to rest? Even if we can’t have a full day of rest, we still need time for recovery. We need to put our hectic lives on pause for a moment to let our body and mind recover. Today’s challenge is to find those moments for recovery. To cope with a busy lifestyle in the long run, we have to find at least one moment every day when we can close our eyes, relax, and just focus on our breathing. This moment could be at the bus stop waiting for your bus to arrive. It could be in the laundry room, stealing yourself a moment before you hang up your clean laundry. It could be going for a short walk on your lunch break, to sit down on a bench in a park and listen to the birds singing. Remember to turn off your mobile phone. Don’t let phone calls, text messages or social media updates steal your attention at times when you could actually slow down and let your mind and thoughts run freely. Where do you find your moments of rest? Please share with us! It’s Friday and after a busy week it is now time to find a moment to recharge your batteries and prepare for a productive and fun weekend! Take a moment to shake off any stress or pressure that you have felt during the week, and step into the weekend with a positive attitude. There are many different ways to charge your batteries. A relaxing and empowering yoga class could be the perfect moment for some, while others prefer a nice family dinner with their loved ones. Some need to have a bit of quiet time all by themselves; others will find new energy when surrounded by friends. Regardless how you relax and recharge your batteries – make sure you find your moment today. Have a Friday Moment to reflect on what you have achieved this week, and set a plan for what you will achieve during the weekend. Let your Friday Moment mark the end of the week. Leave worries and concerns behind you, and focus on positive things ahead. Your Friday Moment will be the starting point of the weekend and by enjoying this moment you will set the tone for the weekend to come. 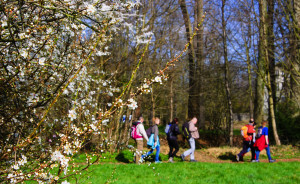 Spring is here, and even if the weather in Northern Europe might not yet be as pleasant as we would like it to be, it is time to go out and get some fresh air. Spend a day outdoors with your friends or family, doing some fun activity together, and get as much daylight as you possibly can to fill up with vitamin D.
We challenge you to spend a whole day outdoors this weekend. Put on comfortable and weather resistant clothes, pack your bag with a nutritious lunch and snack, bring your friends or family, and have fun! You can go cycling, horse riding, canoeing, mountain climbing, explore your city, or just relax or do some activity in a nice park. Regardless what you do, a whole day spent outdoors will surely do you good. This time of the year it is nice to bring a hot lunch in case the sun fails to keep you warm. Prepare a delicious, nutritious soup that you can easily bring in a food thermos. Why not go completely green and try this simple and delicious green pea soup? Place a large pan on high heat with 1 tablespoon of olive oil. Add the chopped celery, carrots, onion and garlic and sautee for about 5 minutes, stirring occasionally with a wooden spoon. Put the bouillon cubes into a jug with the hot water. Stir until it’s dissolved. Add the bouillon and peas to the vegetables. Stir and bring to the boil. Using a blender (or hand blender) pulse the soup until smooth.